I likely haven’t read enough books to do a best of 2016 list for this year, so I’m just going to have to say it here. THIS IS THE BEST BOOK I READ THIS YEAR. It was such a delightful surprise, and I blame it all on my friend Jessie, who got it for me for my birthday. The book follows a motley crew of characters as they travel around the galaxy, and it’s basically a character study. We get to know all of them and their backstories, to one degree or another. And they’re all delightful and lovely. I teared up several times through the book, and always in good ways. The book deals with so many issues, tackling everything from speciesism to personhood, giving them all a very “human” perspective–even though the viewpoints are from many different species. I love how it managed to be relevant to so many of the issues we face in the world today, while never really preaching about them, or making me feel like I had to believe a certain way or I was wrong. The book is not hard sci-fi. Despite the fact that it makes an attempt to solve the problem of the expense of FTL travel, as well as being literally set on a worm-hole making ship, and having a character explain how the ship works at one point, it is still very hand-wavey, and that’s perfectly fine. It’s about the characters, and how amazing and real they are. If I have a complaint with this book, it’s the relative lack of cohesiveness to the plot. The chapters felt rather episodic, and often disconnected from each-other. I’m used to 14 book long epic fantasy series, where the first paragraph of the first chapter ties intricately to the last chapter of the last book, and foreshadowing is set up millions of words in advance. Thus, the fact that events from one chapter I expected to have more impact later did not sometimes bothered me, as well as the fact that the overall plot didn’t really become relevant until the last few chapters of the book. But I was more than happy to ignore that because that’s not what the book was trying to do. It was focusing on its characters, the best of whom was Sissix. Sissix looks something like a dinosaur/lizard, but I’d have to refer to the book to describe her exactly, and I’ll go ahead and let you read it instead. Suffice to say, I fell in love with her, and there were plenty of times I wanted nothing more than to put the book down and give her a hug. This book was also really refreshing for its underlying sense of optimism. I haven’t really been in the mood for dark, depressing reading lately, so the lovely bits of joy that show up all over this book were a welcome relief. It is guaranteed to bring a smile to your face. If all of the above isn’t enough to convince to you read it, how about this: When I finished reading the book, I was over at Shannon (new coblogger)’s house, and I closed the last page, then immediately handed her the book and demanded that she read it. I’m still pestering her about it, and hoping reading happens soon… Also, when Amazon had their holiday sale, while I was only halfway through the book, I didn’t hesitate to pre-order the next one immediately. 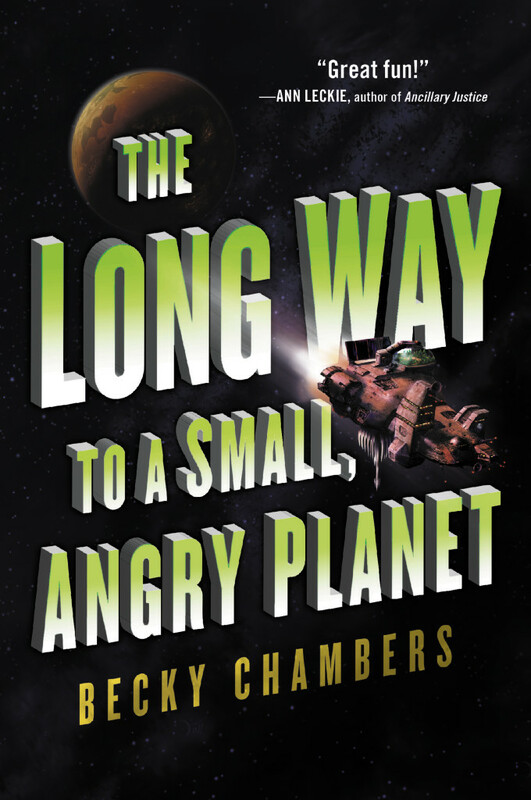 In summary, The Long Way to a Small Angry Planet is a delightful, upbeat, lovely, character-driven space opera about a motley crew built of an assortment of delightful and deep characters from a number of species, taking a trip across the galaxy, and even though there’s not a ton that happens, I absolutely adored this book, and don’t hesitate to give it 5 of 5 stars and my highest recommendation.